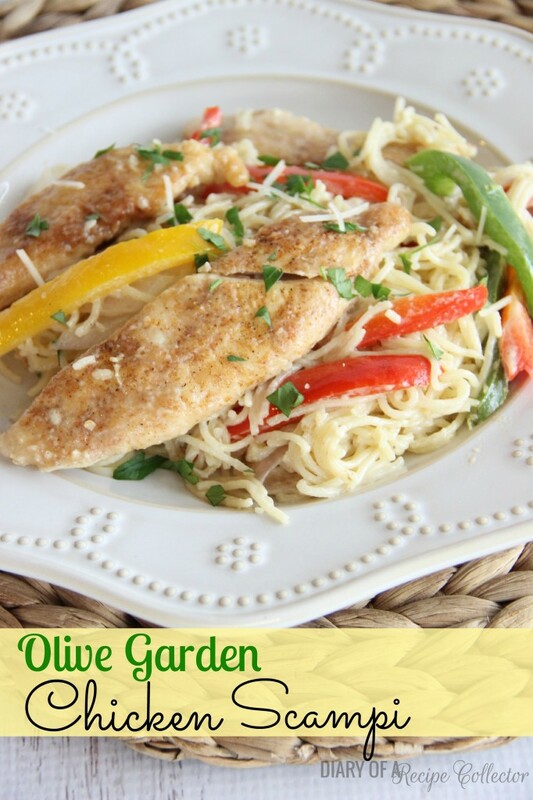 This dish has been one of my favorites to make for a long time…in fact I’ve been making it since I first got to go to Olive Garden a loooong time ago. I loved it so much that I had to learn how to make it. This was back when I was first learning to cook and I don’t think Google was even around. 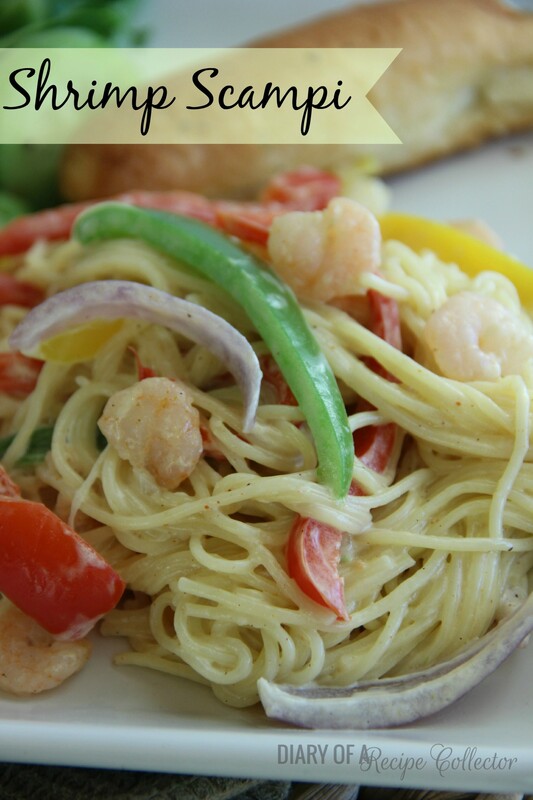 I did find some recipes online for a shrimp scampi and I tweaked that one to create this one. As I’ve learned to cook, I’ve changed the way I make it, and now I bring you my favorite version of it. The chicken is simply thin-cut chicken breasts cut into thirds. They are dunked in a little seasoned flour and pan-fried for a few minutes. I had to fight off the husband and kids to keep them from eating all the chicken before I could finish the whole meal! 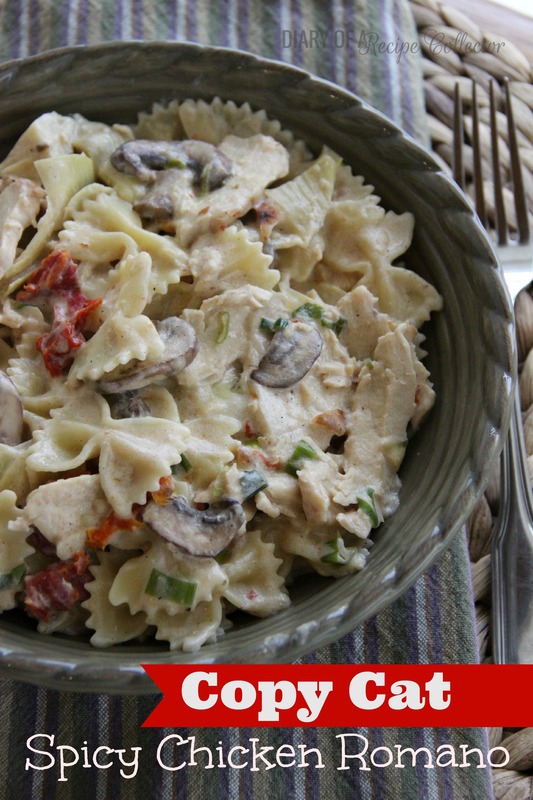 The pasta is creamy and filled with so much flavor from the garlic and peppers. Your house will smell so good! Cut chicken breasts into thirds (like tenders). Place flour in a shallow dish and season with 1 tsp seasoned salt. Heat 1 tbsp olive oil in large skillet. (I use a cast iron). Place chicken in skillet and cook over medium high heat for 4 minutes. Flip and cook for 3-4 more minutes. Remove to a plate. Add 1 tbsp oil to skillet. Add peppers and onions. Season with salt and pepper. Saute for about 5 minutes. Add garlic and saute for a few more minutes. Add cream, milk, and parmesan. Bring to a simmer. Add chicken and let simmer for 5 minutes. (Do not overcook or veggies will lose their bite). Mix in pasta tossing to coat well. Taste to season and serve. And isn’t this a cool pasta strainer? Mmmm one of my favorite restaurants! Love this dish of course! Whole family absolutely LOVED this! Hi Lynn! Thanks so much! We love this one too! Sign me up! 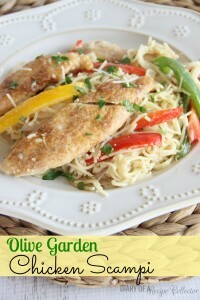 Olive Garden is always a great but the comfort of eating at home! Pinned! you have definitely got me craving pasta now.. definitely going to be making this recipe and reporting back. it looks delicious! 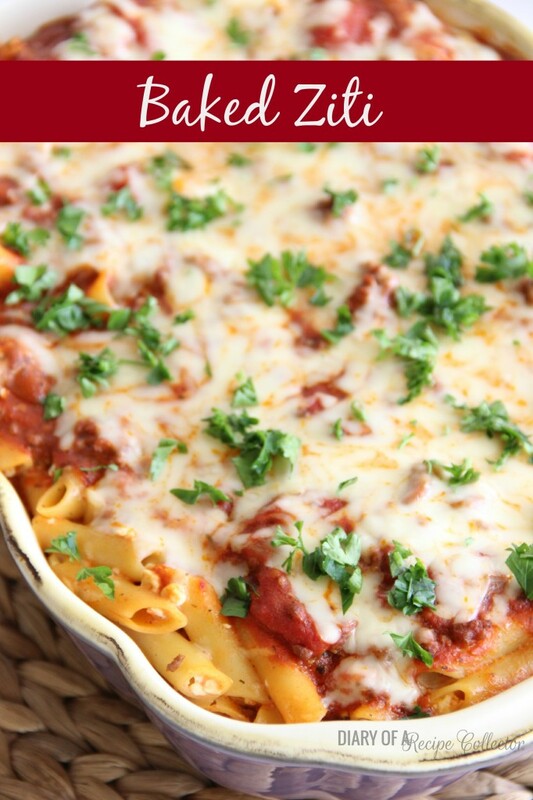 This is my husband’s FAVORITE dish of all time! It is probably for the best that the closest Olive Garden is 2 hours away. haha! If I go to the nearest town that has one for a shopping trip, he will beg me to bring this home. I am definitely going to have to give this a try for his upcoming birthday! Oh good! I hope he loves it! Can’t wait to try out this recipe this weekend. All the ingredients sound delicious. As a passionate home cook, your recipes inspire me. Thank you. Jaren. Hi! That last “add chicken” is a mistake in the recipe. Sorry about that! Hope you enjoy! Hi! I plan to make this dish tonight. I was wondering how many people this serves. Thank you! HiTanisha! It serves around 6 people. Thanks for visiting! Hi Jennifer! I’m so glad you liked it! It’s one of my favorites too!! I am so excited to try this. 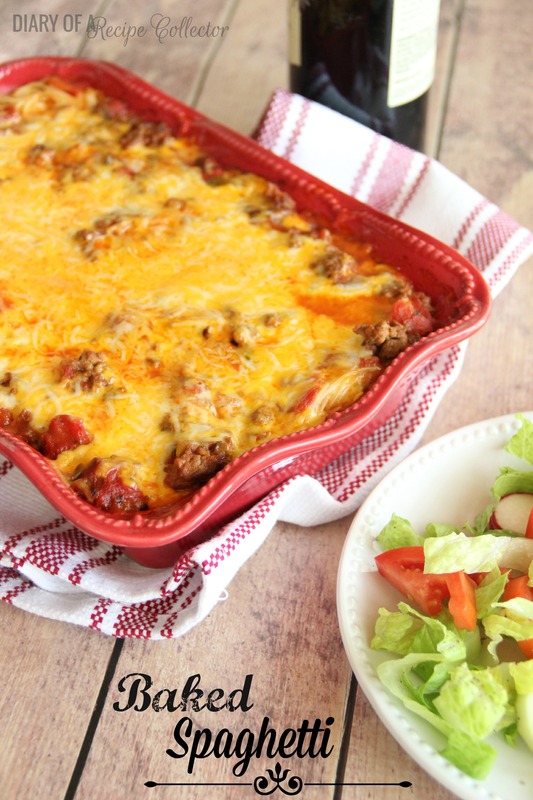 I’ve been craving this dish, (and with 4 kids of my own) I thought “it would be cheaper if I make it at home!” My mouth’s watering already, and by looking at your picture (that is the thing I look at the most…does it LOOK like the real recipe) it sure looks identical. Hi Sarah! You are so right about that! It’s one of our favorites! Thanks for visiting! Hi Heidi! Thanks so much for letting me know! We love this one too! I would like this today but I don’t have heavy cream. Would it be as good without it? Hi Amy! Occasionally, I’ll substitute half and half and I find that just as good. This recipe is beautiful! I love this dish. Thank you for sharing! I can’t wait to try this! I love when you can save a trip to the restaurant and make it even better at home. This is one of my favorite copycats meals! This will be perfect for dinner!